Two iconic brands in adventure formed an awesome alliance! 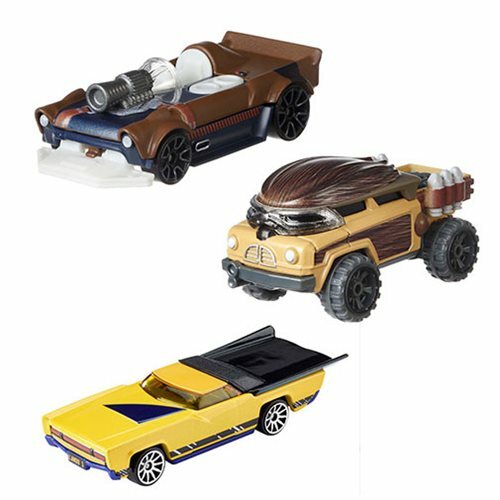 Characters and starships from the Star Wars and Solo: A Star Wars Story are reimagined as Hot Wheels vehicles. Each 1:64 scale vehicle is individually designed to accurately reflect recognizable characters and ships from the universe, combined with the thrill of Hot Wheels racing excitement! There's an entire galaxy to choose from — collect them all! Each sold separately and not for use with some Hot Wheels playsets. Ages 3 and up. Star Wars Solo Hot Wheels Character Car Carship Wave 3 (999C) Case includes 12 individually packaged vehicles.